According to Jenkins (England's Thousand Best Churches) "St Paul's is a building that foreigners can never credit as being English. The exterior is Baroque of astonishing vigour, with giant classical orders on all sides." From the History page on the Church Web Site . . . Commissioners were appointed, one was Nicholas Hawksmore who designed St. Alfege in Greenwich, Christchurch in Spitalfields, St. George in Bloomsbury and many others. 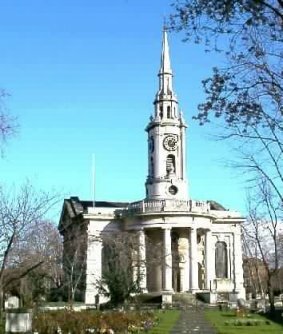 Another was Thomas Archer who designed two other churches, St. John in Smith Square, Westminster - much used in the performance and recording of music - and Birmingham Cathedral. Archer started at Deptford almost immediately and brought to the design his understanding of Roman Baroque and his great flare for originality that is shown in almost every element. The fabric and most of the decoration was complete by 1720 but work continued for another 10 years until St. Paul's was consecrated in 1730. The interior is spectacular (Jenkins), almost a match for Hawksmoor's Christ Church, Spitalfields, and is theatrical. It is centrally planned with vestries in the angles. The overwhelming impact is created by the giant Corinthian columns and deep entablature, encrusted by plasterwork. The galleries are in place, as are the pews. Four private pews. like Royal boxes, jut out from each corner on columns. "The other furnishings are disappointing and not by Archer. . . When properly lit, the sanctuary forms a fine classical composition round the Venetian window, with trompe l'oeil curtains opening above". From the Restoration page of the Church web site . . .
St. Paul's has stood beneath London's rainfall for nearly three centuries. In the past that rain has been acidic and tainted with soot and many other pollutants: the exterior of the church shows corrosive damage that has resulted from this rainfall. Previous restorations have attended to the upper parts of the exterior but the steps at the north, south and west end are badly in need of repair. The roof, too, is showing its age. Inside the church the lighting system is far from adequate. The heating provides hot air to damage the ceiling, joinery and organ but does little for the people. Some joinery repairs are urgently needed and most of the wooden surfaces are blackened with centuries of polish and dirt. The interior is as remarkable as the exterior but it needs repairing, cleaning and redecorating in order that the craftsmanship can be seen. Britain's Heritage Lottery Fund has awarded St. Paul's the largest grant yet accorded a parish church, �2,777,000. This together with other smaller grants from English Heritage, trusts and corporates will produce a remarkable transformation in the early years of the third millennium. A further �500,000 has still to be raised in order to build a new organ, to provide sound systems and to buy temporary staging. We aim to continue to use our great church as a place of worship and a focus for the community. We also want to use this splendid building as an arts venue in order to increase visitor numbers to Deptford and to show our history and architecture to a wider public. Please e-mail St Paul's Church at paulschallenge@paulsdeptford.org.uk for more information about their Restoration Project and the St Paul's Challenge..
ACCESS : Details taken from the services page of the church web site. 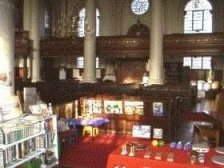 The church is not open all day so please phone or e-mail the Restoration Co-ordinator or e-mail St Paul's if you intend to visit and allow 2 weeks notice so that we can arrange to welcome you. St. Paul's lies within its Churchyard that is enclosed by Deptford High Street, Crossfield Street and Deptford Church Street. The Churchyard can be entered from either the High Street or Church Street and a further access for disabled people will be constructed in Crossfield Street during the current restoration programme. Please click on this link to reach UK Street Map and enter "Crossfield Street" - click on "London Street" and enter. Crossfield Street can be found in the centre square of the detailed local map that will show, it is next to Deptford Station. Deptford High Street links the A200 road- that runs parallel to the south bank of the River Thames from London Bridge to Greenwich and Woolwich - and the A2 London to Dover Road. Parking is very limited within the High Street but there are some free spaces in Crossfield Street and many more metered spaces in a carpark in nearby Giffin Street (5 minutes walk). British Rail - from London Bridge (also Charing Cross and Waterloo) to Deptford on the Greenwich Line - approximately 5 minutes. Leave the station, turn left and cross the road at the pedestrian crossing a little way along the road. Docklands Light Railway - from Bank or Tower Gateway to Deptford Bridge. Leave the station and turn right down Deptford Church Street. About 5 minutes walk to the Church. London Underground - Jubilee line to Canary Wharf and change to Docklands Light Railway to Deptford Bridge, as above. St. Paul's is an Anglican Church within Southwark Diocese. It upholds a liberal Anglo-Catholic tradition. Information taken from the church web site and from Jenkins - England's Thousand Best Churches.